I have a strawberry problem. I was such a freak about strawberries when I was a kid, my Grandma made me a purse with strawberries on the fabric. I was am a nerd. 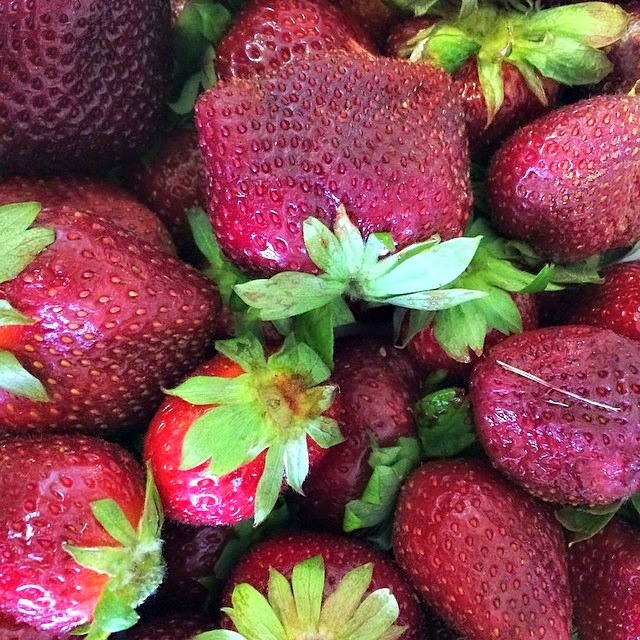 Strawberries are, without a doubt, my favorite fruit. Someday I shall grow them. And annoy my someday family with strawberry everything. In other news, I know I just shared a recipe with balsamic vinegar. But I was in the mood for this salad and so . . . here we are. Caprese salads are on a continual repeat in my house during the summer months. The typical tomato Caprese, with fresh mozzarella pearls is my favorite. Every once in a while I change that up with small chunks of avocado. I have also made a couple of variations to include a plum Caprese salad that was ahhhmahzzing. 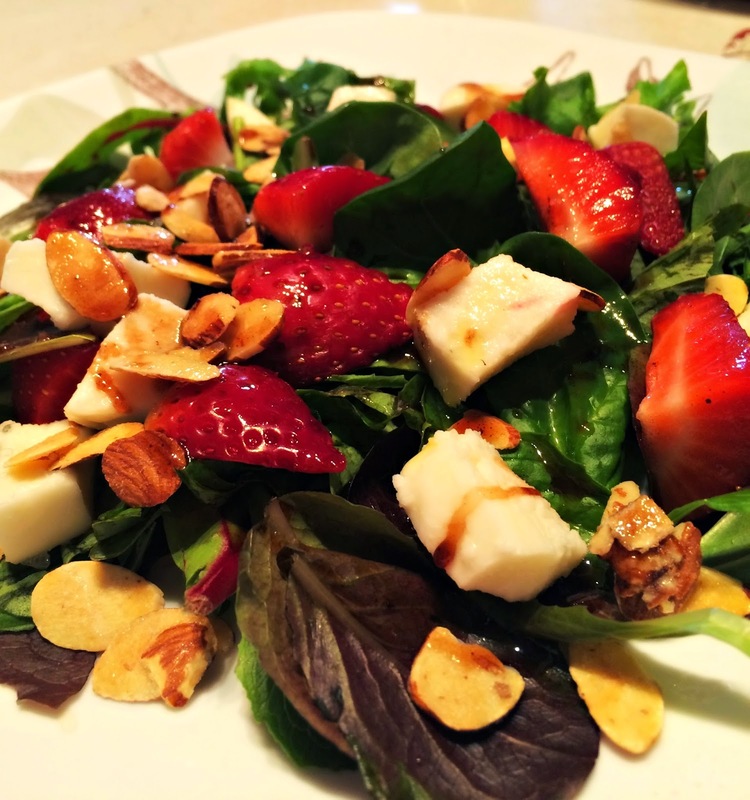 I’ve seen a few variations of strawberry Caprese salads on Pinterest. I’m all about trying a few of those this summer. But this one is a tad different. Me likey. It calls for a balsamic reduction that makes it over the top delish. 1. The reduction is super simple. If you’re like me, I had no idea what a reduction was when I started my learning to cook journey. If that’s the case, Google is your friend. But here is one website you can check out. 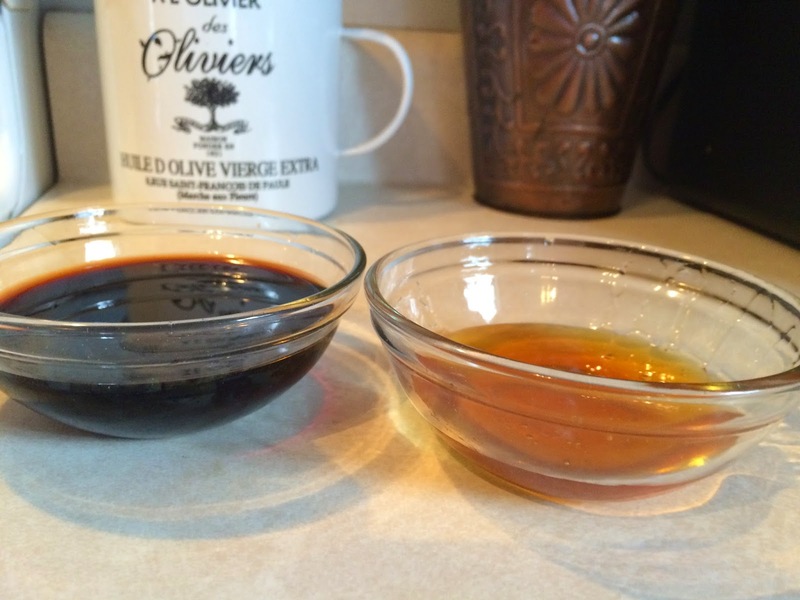 Combine 2 Tablespoons of honey (I use local honey. It’s worth the price, ya’ll.) 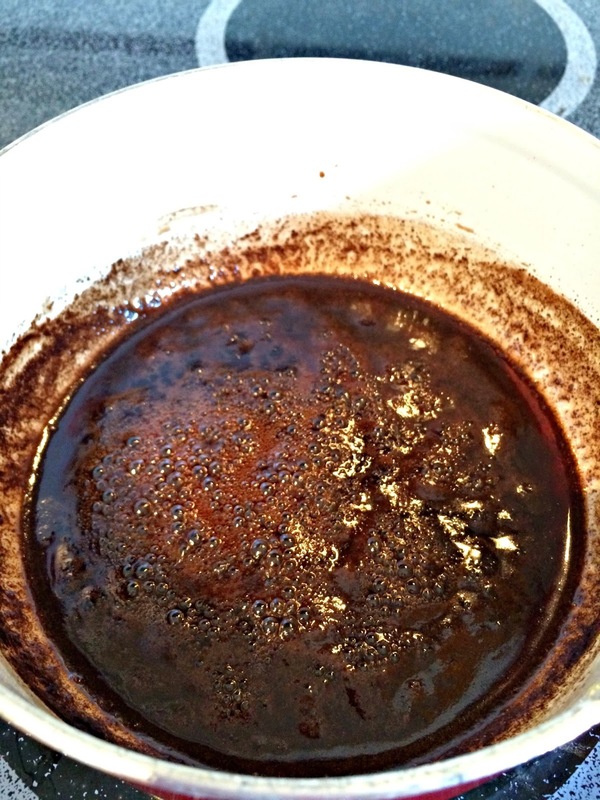 and 1/3 Cup of balsamic vinegar, in a small saucepan (medium to low heat). You should be able to tell that it’s reduced (you will likely be able to see the original line on the side of the saucepan). If you’ve never made a reduction before, you may not want to wander too far from the stove. It should simmer like this for about five minutes. It will be quite thick. 3. Turn off the heat, and set the reduction aside. I cool mine on the counter in the glass container I store it in. 4. The original recipe suggests the use of baby lettuce. I say . . . use what you’ve got/what you like. My preference is a mix of organic spring greens and baby spinach. I love to cook. And I love learning what I can. But sometimes, people are so snobby about food. I can’t handle it. You’re probably not going to get an iceberg lettuce salad at my house. I do think it impacts the taste of the salad. But if you’re not very adventurous and it’s hard for you to step out of your box, use what you’ve got. If you want to branch out, try a red/green lettuce first. Anywho, arrange your greens on a plate. 5. 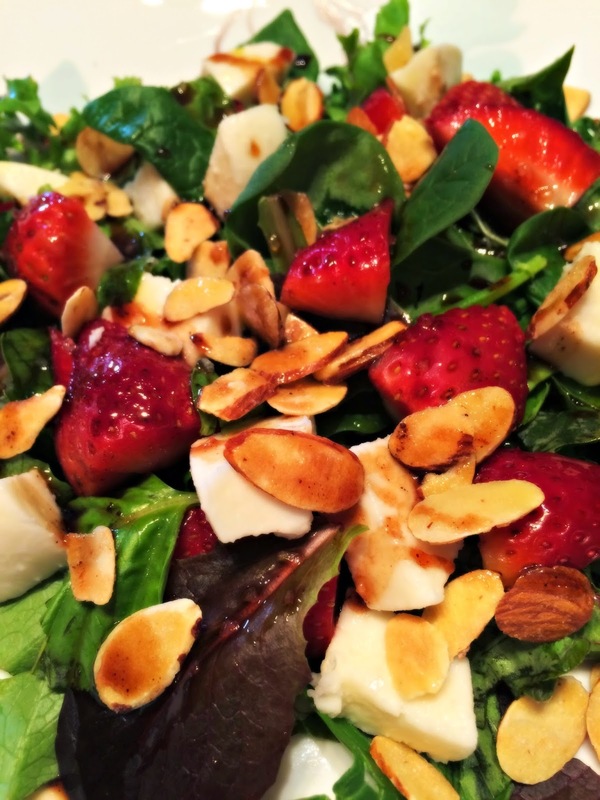 After washing/hulling a handful of strawberries, quarter them and place on the greens. You’ll then place your mozzarella pearls on the salad. I have trouble finding the pearls here (here = the boondocks) sometimes. If you can’t find them, or you already have fresh mozzarella, cut it into small chunks and go for it. Pearls Schmearls. Use what you’ve got. Unless it’s not fresh mozzarella. In that case, get thee to the store. You will then rip up some fresh basil and add that in for good measure. 6. Drizzle 1 teaspoon of olive oil on top of the salad. And then drizzle 1 1/2 to 2 teaspoons (I use 2. Okay, maybe sometimes more. But whatever.) of the reduction. Add slivered almonds (I had honey roasted almonds) and some coarse salt. If you don’t have the flaky or coarse salt, I don’t recommend using salt at all. I didn’t the first time. I loved the salad then. This time? The salt takes it to a whole other level. It’s an awesome combo of sweet, salty and savory. You’ll have enough reduction for 4-5 salads. It will keep at room temperature if you’re like me and cooking for one. But I recommend glass versus plastic for storing. On another note, I ate this with a mushroom alfredo pasta. I am not going to lie to you. I bought a store bought alfredo (Classico). But in a moment of sheer insanity, I made Julia Child’s “Champignons Sautés Au Beurre” to add to the alfredo sauce. Sounds super fancy, right? It’s sauteed mushrooms. But honestly, made this way, they’re amazing.It’s 2 tablespoons of butter and 1 tablespoon of olive oil. It’s impossible to go wrong with mushrooms cooked this way. These sauteed mushrooms actually go in Julia’s Beef Bourguignon recipe (which I have made). I could seriously just eat these without anything else for dinner. I’m not kidding. You think I’m kidding. But I’m not kidding. They’re pretty awesome. I added those to the sauce, cooked up some gluten free spaghetti and then? I chowed down. I might have made a second salad. Okay, I did. So delish.